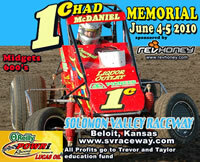 The 4th “Chad McDaniel Memorial” Midget race at Solomon Valley Raceway in Beloit, Kans. joins the USAC National Dirt Midget calendar on Tuesday night, July 30. The Beloit Midget race joins a week of activity filled with USAC National Midget racing, preceding the August 1-3 “Belleville Midget Nationals” at the half-mile North Central Kansas Free Fair oval. The race at the quarter-mile dirt Beloit oval honors the memory of the late Concordia, Kansas driver who lost his life while competing in a 2009 USAC National Midget race at Knoxville, Iowa. The race will be the first for USAC at the Beloit oval, where past “Chad McDaniel Memorial” winners have included Brad Kuhn (2010) and Scott Hatton (2012). Rain forced the 2011 cancellation.